How to become a Professional Knitter - Robin Hunter Designs: Are Men Sweater Worthy? In an earlier post I did on the sweater curse I went looking for a pattern for a man's sweater that I could use for the top of the post. I was a little surprised to discover how very few there are. Check out these searches on Ravelry. I'm not sure why I was so surprised. I've only knit a few myself through my long knitting career. My husband rarely wears sweaters and I guess I thought he was unusual. I have in the past knit them for both my father and father-in-law. I did one for a boyfriend years ago but never did a second as we broke up before I started it. One of my friends just finished a gorgeous sweater for her son. I think the questions are: are we not knitting for men because they don't wear hand knits, are we not knitting them because there are so few patterns, are we too busy knitting for ourselves and kids, or perhaps we just don't think men are sweater worthy? Labels: Knitting patterns for men, Why are There so Few sweater Patterns for Men? Some men are sweater-worthy. Those are the ones who know how to properly do laundry, or who have access to someone who does. Some men do wear hand knits. But most of the time, the things they generally trend towards are so boring to knit, why would anyone bother to make them by hand (unless there's a specific fit challenge)? As far as men are concerned, there might not be any difference between a hand-knit sweater and a purchased machine-knit one. And don't forget that men tend to be bigger than women. So, big boring knitting that might not be properly cared for: why would I want to put myself through that more than once? A men's hand-knit sweater that is actually worn and properly cared for is a true sign of love. As a male who loves sweaters, I wish I knew someone who knits, as I would love a handknitted sweater. Most of the hundred sweaters I own are purchased online from woolen stores in Great Britian or from ebay. 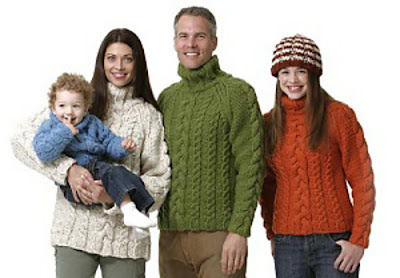 I am partial to cable knit sweaters, most of my sweaters are thick textured or cableknits. I would love to find someone who could knit me a handknit cableknit sweater. Or if I can't, I may just need to learn myself. I do like knitting for men. But the men make so much restrictions about it! 5. will you handwash it for me? So maybe women are just frightened about restrictions. 2. they are generally speaking proud of it and they worship the work by wearing it quite often. 3. they are amazed every time they wear it: how many stitches did you make in it? Facit: just go for it, don't mind the restrictions. No sweaters for my husband, he would melt. But my brother, he wears the bejeebers out of a handknit sweater, tattered neckline and holey elbows, filthy cuff to cuff. No matter the design, if it was made for him, he is endeared. I have knit sweaters for three men. First, my husband who chose the yarn (yellow ombre) for a sleeveless pullover (the type of sweater he was always wearing). I knit a simple cable which was lost in the variegated coloured yarn. The outcome was that he looked like a walking corn cob. Two known wearings. The second was for a friend who was taking a trip to Italy. It was a cotton sleeveless pullover in navy from Alice Starmore's Knits for Men. He loved it. True success story. The third was a Nordic pullover with the running reindeer around the chest and the back.The difficulty with that was the **third** reindeer's hind leg was going the wrong way because I'd knitted and ripped so many times that I was tired and wanted to move on. This reindeer was also on the back of the sweater and wasn't noticed in the same way as the ones on the front. The pattern directions were of the type "knit to centre then reverse to finish" and I changed it so the reindeers were following each other rather than face to face. Maybe I caused my own problems? That sweater was well loved throughout its lifetime. And suited my friend perfectly. Honestly, in my experience, the men I've knit for have been more appreciative of my knits than the women (with my mom being the only exception). I've knit two sweaters for my husband and have at least 3 more I'd like to try. I knit a sweater for my dad and a sweater for my father-in-law. I've actually never knit a sweater for myself, but that's because I'm so large that I'm reluctant to make a garment that big. I began to knit an Aran sweater for my husband but somehow lost count on what row I was on. I had to put it aside until I gained enough experience to pick it up again. There are so many cables and twists that when I thought I figured it out I started to knit only to see that I was once again wrong. I left it for now but am going to try a pattern from Drops that he likes. That one has "Reverse shaping so I hope I don't end up making a mistake like what happened in the reindeer sweater above. Although the sweater doesn't have a picture I am afraid I may put the inside on the outside or something.